Deron Cherry recalled his son’s 2009 soccer practices taking place in a Hy-Vee parking lot due to a scarcity of fields. Cherry and his wife wanted wanted a safer place for their children to practice soccer, he said, and she envisioned a practice, game and tournament venue with all the amenities soccer families could wish for in one location. Seven years later, Cherry and three business partners are preparing to break ground for such a groundbreaking facility: the Gateway Sports Village. “There truly is no other place like this in the entire world,” said Kurt Pycior, Cherry’s development partner and the man who coached his son’s team back in the blacktop days. He was speaking during Tuesday night’s meeting of the Grandview Board of Aldermen, which voted unanimously to approve $61 million in tax increment financing for the $234 million sports-anchored mixed-use development. Over a 23-year period, TIF is expected to divert $33 million in property tax revenue and $28 million in economic activity tax revenue generated by the project to cover eligible costs. Construction of the 200-acre project is scheduled to begin next month on the north side of Missouri Highway 150 between Byars and Kelley roads. A general contractor has not yet been announced; Populous, a leading global sports design firm, is the project architect. The project is being developed by PG LLC, which includes Cherry, a former Kansas City Chiefs all-pro safety; Pycior, a commercial builder and developer; Matt Taylor, general manager at Pycior + Co.; and Shane Hackett, executive director of the Heartland Soccer Association. The Overland Park-based association operates the largest youth soccer league in the United States, with more than 30,000 participants, Hackett reminded Grandview officials Tuesday. Heartland, which now attracts tournament teams from 16 states to the Scheels Overland Park Soccer Complex and Swope Soccer Village in Kansas City, has signed on as the master tenant and field scheduler for Gateway Sports Village, as well. Hackett said full league play will begin there in the fall of 2017. 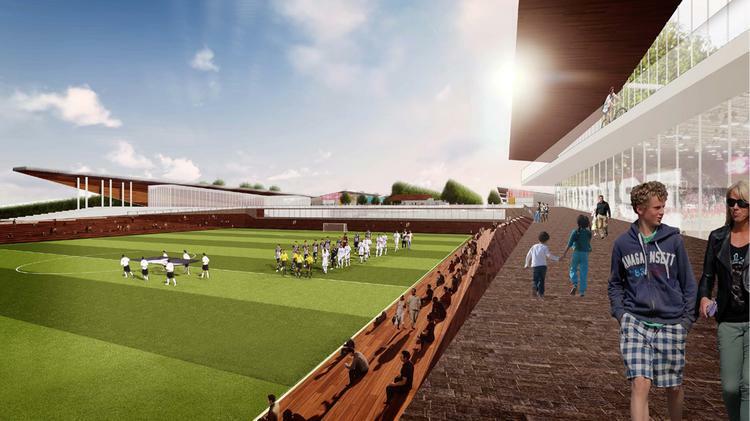 The development calls for 12 lighted artificial-turf soccer fields; an 86,000-square-foot fieldhouse; three hotels with a total of 540 rooms; and 334,000 square feet of mixed-use space, including 21,000 square feet of restaurants. The land reserved for future uses is contained in one of four TIF project areas that the Grandview aldermen approved Tuesday. The $61 million in TIF for those areas is part of a $78 million public support package for the portion of Gateway Sports Village that excludes a residential component consisting of 40 existing single-family homes and 250 planned apartments. In addition to TIF, the city has approved a 1 percent community improvement district sales tax surcharge projected to bring in $8.9 million for the project over 27 years. Hotel and motel taxes will bring in an additional $8.1 million. Joe Lauber, an attorney who serves as Grandview’s special counsel on economic development matters, said the $78 million incentive package has a net present value of $43 million and represents 18 percent of the project’s financing. The city’s policy is to keep public financing less than 25 percent of project costs. Project 1, to be started in July and completed by June 2018, includes all 12 fields and 154,000 square feet of mixed-use development. Project 2, to be started in September 2017 and completed by December 2018, includes the 86,000-square-foot fieldhouse, 79,000 square feet of mixed-use development and a 190-room hotel. Project 3, to be started in August 2018 and completed by January 2020, includes a 200-room hotel plus 86,000 square feet of medical and other mixed uses. Project 4, to be started in August 2020 and completed in 2022, includes a 150-room hotel, 15,000 square feet of retail and the future commercial and recreational uses. COVER STORY: Sports-anchored projects: New ballgame or passing trend? Rob reports on real estate and development. Get Contact Information for Populous.